For 2 year old little boys the cry Ima (Mommy) comes when they are hurt or scared. And their mother comes running to see what is wrong. But for 2 year old Moshe Holtzberg, Mommy will not be coming to heal his hurts. His mother, Rivka Holtzberg was murdered at the Chabad Center in Mumbai, India last week. Just before the body of Rivka Holtzberg, 28, her husband, Rabbi Gavriel, 29, and four other Jews killed by Muslim terrorists in Mumbai last week were flown back to Israel on Monday, her father promised that his family would continue her emissary work for Chabad in the same city where she died. “My wife and I will continue their [Rivka and Gavriel’s] mission, to carry out the work of the Rebbe here, at least until [their son], Moishe, grows up and then he will continue it,” Afula’s Rabbi Shimon Rosenberg told reporters, breaking into tears as he spoke. His son, Yossi, told The Jerusalem Post from his Haifa home that it was still unclear whether it would be his parents or other members of the Holtzberg family who would return to Mumbai in the name of the couple who had lived there and operated the Chabad house since 2003. “There is no comfort for what happened. But we can remember Gabi and Rivki if we are connected to the place where they lived. My parents are taking full responsibility for the continuation of my sister’s work,” he said. Shimon and his wife, Yehudit, had flown to India immediately after hearing of the attack. One cannot stop good people from doing good deeds or works. Tragedies like these only reinforces the resolve of those trying to bring joy and peace to others. They were due to arrive back in Israel late Monday night on an IDF plane that carried the six bodies, including those of Aryeh Leibish Teitelbaum, 37; Bentzion Chroman, 28; Yocheved Orpaz, 62, and Norma Shvarzblat Rabinovich, 50. Upon their return late Monday night, the state was scheduled to hold a small private ceremony for the victims, after which a number of the families planned to hold burial ceremonies on Tuesday. The Holtzbergs’ funeral will begin in Kfar Chabad on Tuesday. Mourners will proceed from there to Jerusalem to bury the couple on the Mount of Olives. Among those on the flight back to Israel Monday night was Holtzberg’s two-year-old son Moshe, who was saved from the building by his Indian nanny Sandra Samuel, to whom he has clung since the rescue. An Interior Ministry spokeswoman said Monday that no formal request had been made as yet for Samuel to receive either permanent or temporary residency in Israel. However, she added that Interior Minister Meir Sheetrit was willing to find a solution that would allow the woman, an Indian native, to stay here, at least for the short-term. In Mumbai, Samuel worked on obtaining an entry visa up until the last minute and so missed the ceremony held earlier in the day at a Mumbai synagogue for the six victims. If ever there was an angel during this massacre, it was the nanny, Sandra Samuel. She gathered up little Moshe and dared the terrorists to kill her and the child too. There are no words of praise that one could use in regards to this fine lady. No reward on Earth is too good for her, and her greatest reward will come from God. For she has saved a life. Wearing a green T-shirt and clutching a red ball, Moshe had a hard time sitting still in the synagogue as he sat on the lap of Samuel’s friend and looked about for his missing parents. “Mommy, Mommy,” he cried out, with his head flung back, in a voice that echoed through the sanctuary and was filmed by Israeli television and showed a number of times in Israel throughout the evening. What sorrow for these families. The 6 Americans and the 6 Israelis murdered. Killed in the name of Islam. How proud the murderers families must be! What great deeds they accomplished! He who saves a life, saves the world entire. Filed under: Moshe Holtzberg, Mumbai, Sorrow, Terrorism |	Comments Off on Ima, Ima! Mumbai: Unless we stop it…"
The shooting in Mumbai (Bombay) is apparently over, and even as the blood still runs in the streets, political pundits and talking heads rush to declare the “who, what, why, and how”. 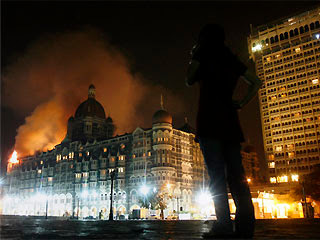 “Who’s the brain behind the Mumbai attacks? And you KNOW I have more to say! Go to NewsBlaze here for the rest…. Filed under: Mumbai |	Comments Off on Mumbai: Unless we stop it…"
Hostages were rescued from the Taj Hotel in Mumbai, India, after attacks in the Indian financial capital left at least 78 dead and hundreds wounded. Mumbai, formerly known as Bombay, is the capital of the Indian state of Maharashtra and the financial capital of India. With an estimated population of thirteen million, it is one of the most populated cities in the world. Along with the neighboring suburbs of Navi Mumbai and Thane, it forms, at nineteen million, the world’s fifth most populous metropolitan area. Mumbai lies on the west coast of India and has a deep natural harbour. Mumbai’s port handles over half of India’s maritime cargo. The commercial and entertainment centre of India, Mumbai generates 5% of India’s GDP and accounts for 25% of industrial output, 40% of maritime trade, and 70% of capital transactions to India’s economy. Evidence of Mumbai’s history dates back to 250 BCE and has been continually inhabited since then, although its founding can be considered at a much earlier date. A very lovely and lively city. But not today. Today it is the scene of carnage, mayhem and death caused by the Religion of Peace aka Islam. Several sites in Mumbai, India’s financial capital, were hit Wednesday night by a wave of terror attacks, reportedly aimed at Americans and Britons, that left dozens dead and hundreds injured as Indian forces battled with terrorist gunmen to free hostages from two luxury hotels. There were varying reports of at least 50 and as many as 100 people rescued from the Taj Mahal where a fire had broken out, and India’s NDTV reported Thursday morning that authorities had the scene under control. Meanwhile, police continued to evacuate people through the Oberoi hotel’s basement, and gunmen reportedly had taken hostages elsewhere in the city. Casualty figures varied, with most media reporting at least 80 dead and 200 injured. Of the gunmen, four were dead and nine arrested. It isn’t clear yet what motivated the attacks, which also targeted a popular tourist attraction and a crowded train station, though eyewitnesses said gunmen were heard shouting questions about who American and British passports. 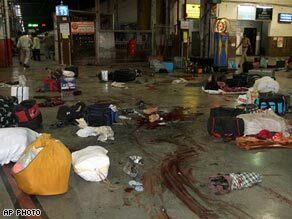 Mumbai has frequently been targeted in terrorist attacks blamed on Islamic extremists, including a series of bombings in July 2007 that killed 187 people. A little-known organization calling itself the Deccan Mujahideen claimed it was behind attacks. A man injured in a gun battle is carried to a hospital in Mumbai, India. “The terrorists have used automatic weapons and in some places grenades have been lobbed,” Maharashtra Police Commissioner A.N Roy said. Early Thursday, several European lawmakers were among people who barricaded themselves inside the Taj, a century-old seaside hotel complex and one of the city’s best-known destinations. “I was in the main lobby and there was all of a sudden a lot of firing outside,” said Sajjad Karim, part of a delegation of European lawmakers visiting Mumbai ahead of a European Union-India summit. The scene in the train station after the attack. 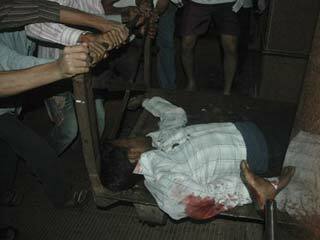 As he turned to get away, “all of a sudden another gunmen appeared in front of us, carrying machine gun-type weapons. And he just started firing at us … I just turned and ran in the opposite direction,” he told The Associated Press over his mobile phone. Britain’s foreign secretary, David Miliband, strongly condemned the attacks. “Today’s attacks in Mumbai which have claimed many innocent victims remind us, yet again, of the threat we face from violent extremists,” Miliband said in a statement. This story is still on going with more deaths to be expected. That the terrorist were using automatic weapons and grenades, the scale of the attack, and the number of attackers, leads me to the conclusion that this wasn’t the work of some splinter group, but the work of a major terrorist group. It is just too large of a scale to be done with such precision and timing by a small splinter group. Deccan Mujahideen may have taken credit for this, but I do believe that the real forces behind these attacks are Indian Mujahideen and Al Qaeda. Only they have the means, money and power to plan and execute such an attack.